When I see passion fruit mentioned anywhere on a dessert or cocktail menu, I immediately order it. The tart tropical fruit is my absolute favorite flavor and I try to enjoy it as often as possible. The only problem is that way too many places get it wrong. They use artificial extracts, mute the bright sour flavor with too much sugar or other fruits like mango or commit other kinds of passion fruit-related crimes [aka a crime of passion fruit!] that leave me cranky and incredibly disappointed. The only time I'm guaranteed to not be disappointed? When I make it myself, of course! 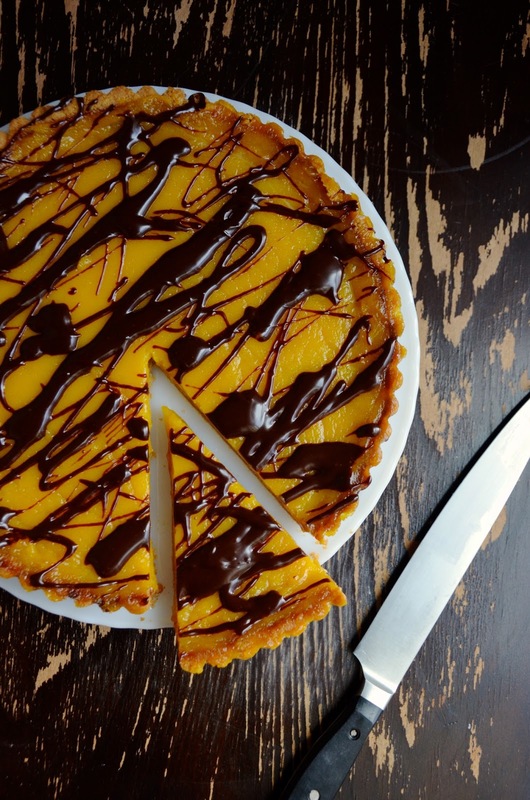 Hence the many passion fruit recipes on this blog, and now...this beautiful Passion Fruit & Dark Chocolate Tart! Made with real passion fruit puree, I promise you it is the real deal. It's super tart and luscious curd under thick drizzles of dark chocolate ganache all nestled into toasty brown butter shortbread crust. 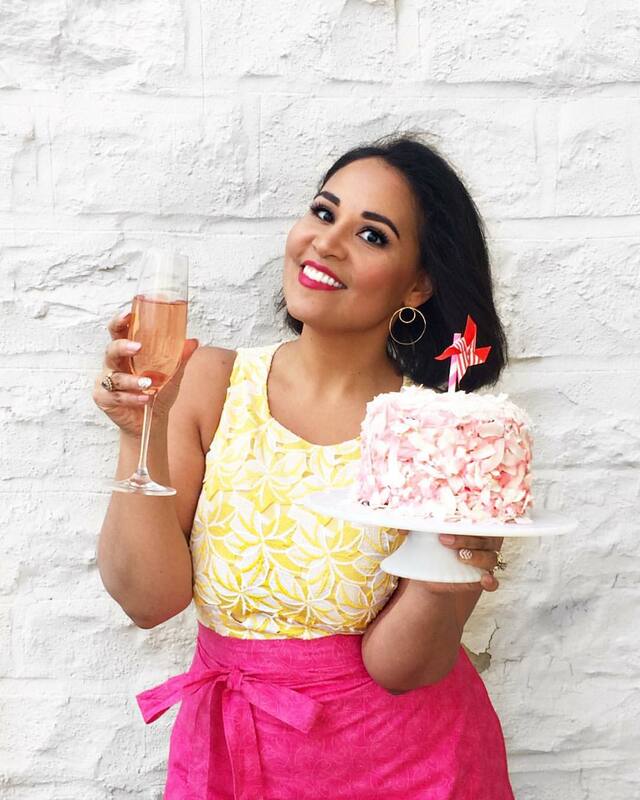 It's rich and decadent and the sort of thing that you can serve at a special occasion, or just tuck in the fridge or freezer to enjoy by the slice when the craving strikes. Note that this tart does require a few steps and a bit of patience while you wait for things to set and cool, but they're all very easy. Just take it one component at a time and I promise it will be worth it! Crush the cookies in a food processor until you get a very fine sand-like crumbs. Pour into a bowl. Place the butter in small saucepan over medium heat. Cook until melted completely—about 3 minutes—then continue to cook for an additional 3-5 minutes, stirring occasionally, until butter is slightly golden and smells nutty. Keep an eye on it as it can burn quickly. Remove butter from the stove and strain through a fine mesh sieve or paper towel-lined colander into the cookie crumbs. Discard the strained solids. Mix the cookie and butter mixture until evenly combined and the texture of wet sand. Transfer crumbs to the tart pan and press tightly into the bottom and up the sides of the pan using your fingers. Use a fork to prick around the bottom of the tart crust. Place a heavy-bottom stainless steel or enamel saucepan on the stove over medium-low heat and add the passion fruit puree, sugar, beaten eggs and yolks, and salt. Whisk together quickly until smooth, then continue whisking at a steady pace for about 8-10 minutes or until filling thickens enough to coat the back of a spoon. If the mixture starts to boil while cooking, lower the heat to keep it at a very gentle simmer. Remove from heat and whisk in the butter slowly, one small piece at a time, until all the butter is incorporated. Pour the filling into the crust until it reaches nearly to the top of the crust (you may have a little extra filling leftover). Lower the oven temperature to 325 degrees F. Bake filled tart on the baking sheet for about 20 - 30 minutes or until filling is puffed, slightly caramelized around the edges, and only slightly jiggly. It is OK if a small amount of filling bubbles over while baking (this is what the baking sheet is for). Remove from oven and let cool at room temperature 15 minutes before transferring to refrigerator to chill completely at least 1 hour. Once chilled, remove the outer ring gently and then slip off the bottom of the tart pan and slide pastry onto a cake pan or serving dish. Combine the chocolate and cream in a small saucepan over low heat. Whisk continuously until the chocolate is mostly melted. Remove from heat and keep whisking until smooth and glossy. Let cool 5-10 minutes, then use the whisk or a fork to drizzle over the chilled tart. Let set 10 minutes before serving. 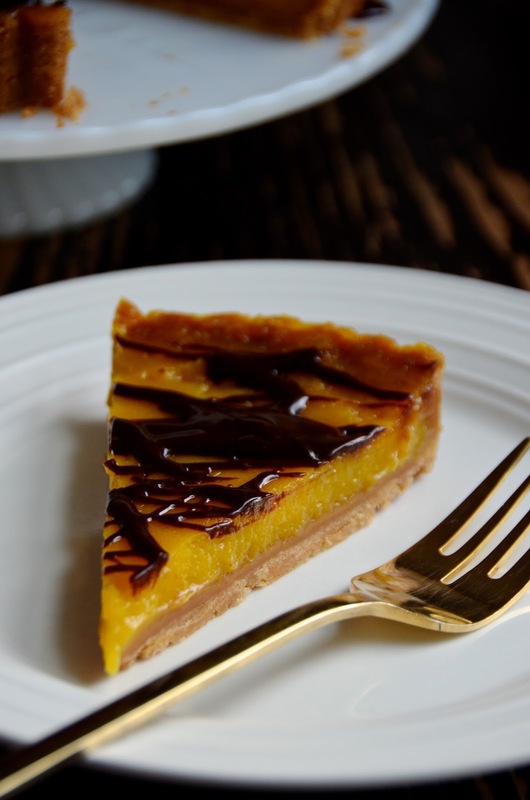 Tart can be made one day in advance; cover loosely with plastic wrap and store in refrigerator until serving. Best served chilled.